I got on South Silver Creek the other day. It's a classic in a novelty sort of way. It drops 590 ft. in the one mile that's runnable. Lots of slides on granite, some great boofs, and most of it is relatively easy. There are a couple drops that are more significant, and with only two of us on the trip we planned to walk those. But on the portage of the first big one (Skyscraper) I slipped and took a paddle to the face. So instead of putting back in and running a few drops before the next portage we just kept walking. We had gotten the best stuff - the 300 ft. slide Autobahn at the start, and the teacups section just above Skyscraper. So we called it a good day and left satisfied. I also got a new camera and was testing it out. It's a Sony Nex-5. I need to learn more how to use it but it takes some pretty sweet shots. It has an automatic panorama setting that works great (that's the top picture). And it also shoots at a high frame rate (10/s at full resolution). Here's a link to the pics from the day. 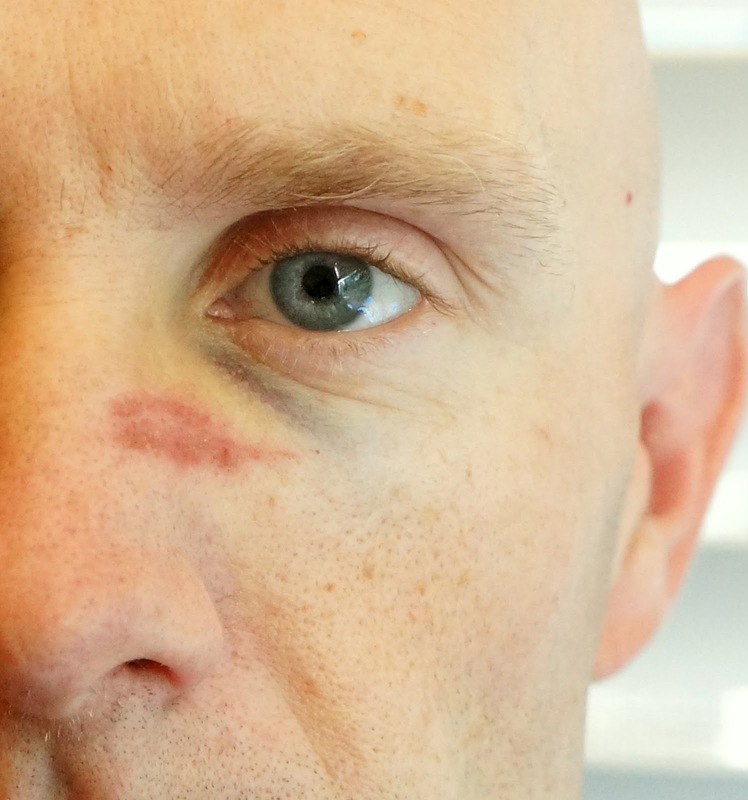 And here's the video from the day. All shot with my GoPro. And here's the video I shot from my first time down four years ago. 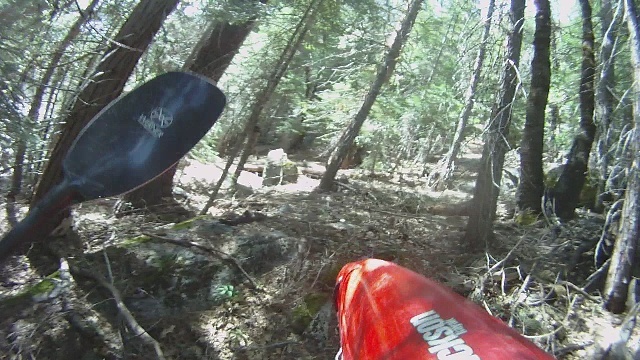 Don't know if my paddling has gotten better, but at least the video quality has improved. Once again, it's often the little things that make classes new and fun. I was teaching on the river over the weekend and had a common situation come up. We had a group of students in a mid-rapid eddy (class I). My partner went down to the next eddy to show how to do it and I started to send the students down. A couple students were nervous because the current was quite fast. The first student flipped on the eddy line and I followed him out to provide a bow rescue. But he got his hands backwards and in the confusion pulled out. No big deal - I just towed him into the goal eddy and he was fine. But now the rest of the class was upstream by themselves. It was a short distance and we could make eye contact and communicate. We could have just told them to come on down, but I knew they would be nervous. So I decided to attain up to talk to them and be there for them. The river was medium high (2,500cfs on the SF American for those that know it). I've never had to attain in this spot before at this level and wasn't sure I could do it. But a little eddy hopping and one long, hard ferry got me up there. It was a great little challenge that allowed me to push myself while teaching on class I.
I reassured the students it was all good, and they just needed to hold their edge throughout the turn. The first student made it look easy. 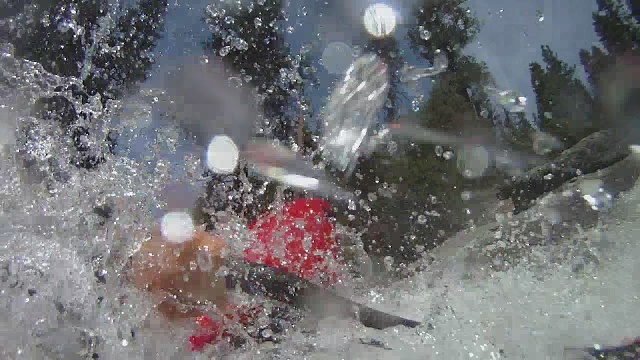 The next flipped and swam - I chased her down and got her to the eddy. We still had a couple left in the upper eddy, but this time I just waved them down. The attainment was fun but too much work to repeat. In fact, the attainment was so fun that after we finished up for the day I grabbed the shop's demo slalom boat and walked down to the bridge. No shuttle, no problem. I paddled upstream, trying to see how far I could get. I made it up the first set of riffles rather easily, surfing one little wave forward after another. Nice to have a fast boat. But then there was the island. I tried the main channel but the eddy didn't get me close enough and the current was too fast. I tried the side channel - there was a fair bit of water so the rocks were covered and I made it up the bottom drop. But the top tier was just too shallow - I couldn't get a full blade in the water to generate any speed. So I went back to the other side and walked from the top of the bottom eddy to the bottom of the middle eddy. I refused to walk the whole way up - I got back in the boat and after what seemed like five minutes of hard paddling straight into the current I was able to get up to the flat below 'Old Scary'. Old Scary is a class II rapid with another island in the middle. The left channel is straight and fast and shallow - no chance of getting up there. But I attained up to the middle eddy by the island, then over to the river right eddy. That got me within about twenty feet of the top. If I could make it up this rapid it would give me another half mile of upriver paddling before the next rapid. But it was rocky and fast - I tried to surf my way up but couldn't quite make it. I think it might be possible at a lower flow when the current is slower. So I turned around and floated back down to the bridge. My what adventures we have! Some days things just don't go right. With a day off and friends coming to town to paddle, everything should have been good. But the friends were delayed a day. No problem, there's plenty of folks around to go paddle with. Boomer was talking about doing Golden Gate on the SF American. I haven't been paddling a lot and knew it would be pushing it to run something that hard, but I was still game. But we needed a third strong paddler, preferably one who knew the run. Thought we had one the night before but by morning he was headed elsewhere. No problem, we revised to do Lover's Leap and I found a new third to join us. Boomer's car was in the shop so I agreed to pick him up on the way and we'd meet the third en route. But once again our third decided to head north to other waters. So Boomer through a bike in the back of my truck for the shuttle. He had done the lower section of Lover's a few days prior and so we decided to do the middle section - most say it's better anyway, and even a touch easier. We locked the bike on the road just above the nasty waterfall and drove up to the put in. 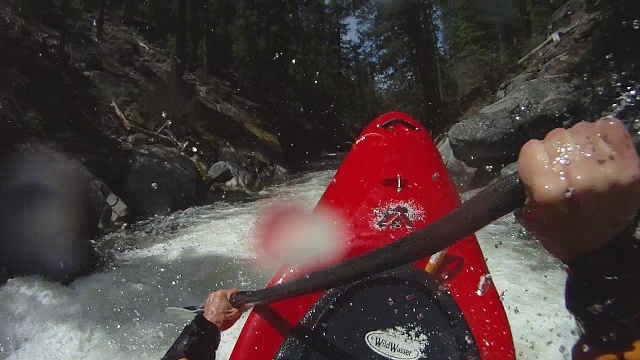 Flows were low but it made the pace manageable - there's very little space between the rapids on this run. But even at the start we saw lots of signs of wood - most of it was out of play but we were taking our time and making sure everything was clear. Shortly into the run Boomer led off a nice boof but landed hard on a hidden rock and cracked his seat. He also hurt his back/ribs in the process. But we continued on. There were some fun rapids but the wood kept getting worse. Lots of scouting and some painful portages around logs. Boomer's back was hurting more and more and made paddling hard and trying to lift a boat excruciating. The quick four mile run was turning into a slow arduous journey. 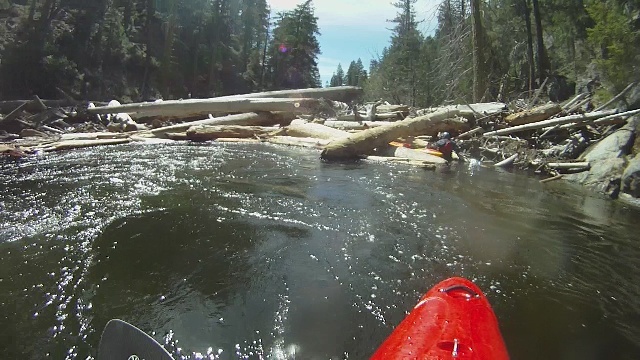 Eventually we got to a river wide log jam. A big one. It looked like beavers on steroids had gone crazy. As we climbed out on the log pile (the only way to portage) we saw another jam downstream. Boomer was hurting and tired of paddling with all the dangerous wood. I wasn't really have much fun on the water, either. So we looked up and figured the road was as close here as it was likely to get for a while. So we started the hike out. The hill was steep and covered in pine needles and crumbled granite. I could at least shoulder my boat - Boomer couldn't lift very well so he would hike up and haul his boat up with a rope. It took two hours to climb out, with the very last bit the steepest. 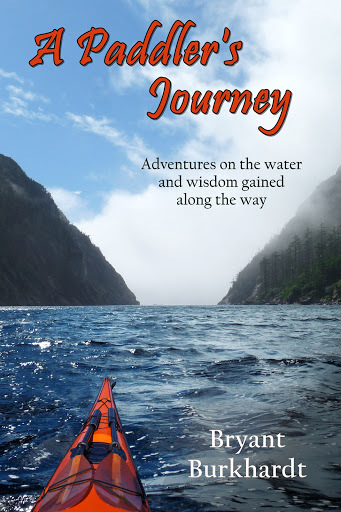 I had gone to climbing with both hands with my boat tethered behind me when, within one handhold of the top, the log I was standing on gave we and I my boat started downhill with me tethered to it. I caught myself on tree quickly enough but I brought out the rope and finished the last pitch and pulled my boat up from the top. So now we're back on the road but in between the bike and the car, thinking we were much closer to the bike. We tried to hitch for a while but Californians don't seem to eager to pick up dirty, ragged guys wearing paddling gear. No problem, I started walking towards the bike. Turns out the car would have been just as fast a walk. Once at the bike I rode but up to the boats and we finally caught a break and someone stopped to give us a lift. Boomer retrieved the truck while I packed up and we were loaded and back home only slightly late for dinner. Certainly not a picture perfect day of paddling. But aside from Boomer's injuries (which appear to be nothing major, thankfully), it was a grand adventure. It's days like this that we need to appreciate what we do and what we're capable of. It's the hard and tiring slogs that we must endure to receive the reward of paddling beautiful rivers in beautiful places. It's what makes us stronger for the next time. And the next time can never come too soon.